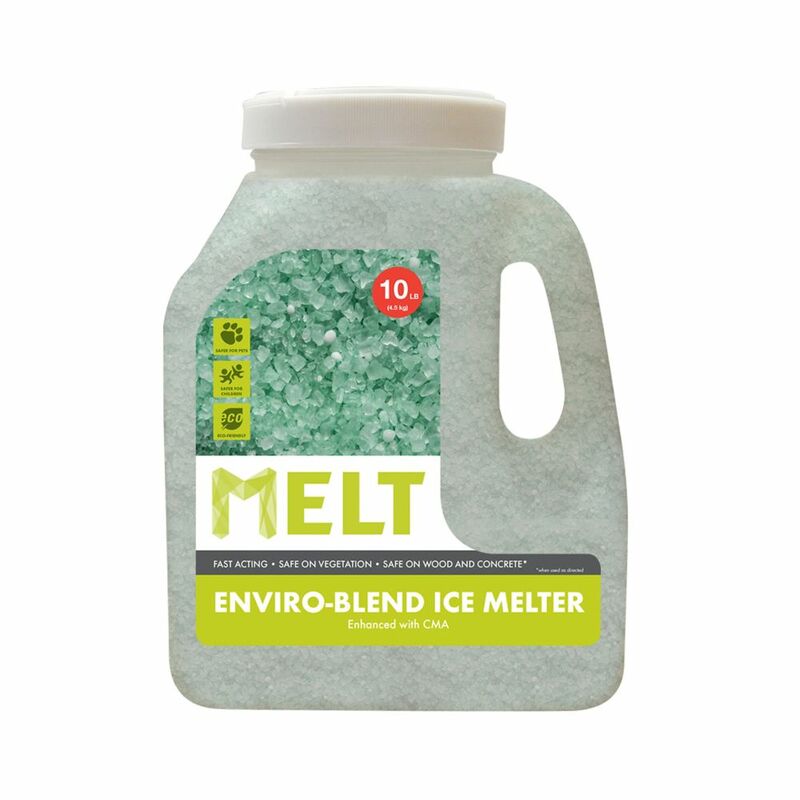 MELT enviro-blend ice melter provides a greener, yet equally effective, de-icing alternative to more harmful melting agents. When used as directed, MELT enviro-blend will not harm grass, wood, concrete, metals or other vegetation and is safer for pets, children and the environment. MELT enviro-blend exhibits the following properties: ANTI-CORROSION FORMULA: Enhanced with CMA (calcium magnesium acetate), an environmentally benign de-icing agent, MELT enviro-blend ice melter delivers fast and effective results without damaging metal surfaces, such as the exteriors of cars, trucks and other equipment. FAST ACTING: MELT enviro-blend goes to work immediately upon contact with snow and ice to accelerate the de-icing and melting process. Pre-treating surfaces with MELT enviro-blend will also prevent ice and snow from accumulating. LONG LASTING :MELT enviro-blend time-relaxed formula stays on the surface area longer for added protection and better control of the freeze/thaw cycle. Scotts ezmelt Ice Melter with Heat Lock Technology melts ice 33% faster and penetrates 87% more ice using a unique All-in-One Particle, giving you great results in less time. Each pellet contains salt for melting at higher temperatures (-1 to -9C) , Calcium Chloride and an Organic Melting Accelerator for melting at lower temperatures (down to -31 C). It also contains a corrosion inhibitor which helps reduce damage to cars and surrounding metal surfaces. Plus, what makes Scotts ezmelt so effective is the residual brine it creates to help reduce ice and snow build up from reforming. Versus rock salt and leading blended ice melt product when used as directed. Based on independent laboratory studies at -10 C. Less ezmelt is required to melt the same amount of ice vs rock salt and leading ice melt brand when used as directed. Based on independent laboratory studies. DICE THE ICE. Chip away those icy days with Snow Joe's 7-Inch Blade Ice Chopper. Built with a spring-loaded handle and a non-slip D-ring grip, the SJEG700 absorbs the shock of ice chopping to reduce wrist and shoulder strain! Its durable, 7-inch carbon steel chopper blade and its heavy-duty steel shaft offer control and precision to swiftly scrape, slice, dice and break through layers of tough ice. The rugged, reinforced D-ring handle provides a safe, secure grasp even with gloves. When it comes to ice, don't play nice - Go With Joe! Professional strength MELT is a unique formulation of calcium chloride pellets that accelerates the melting process by generating a large amount of heat on contact with snow and ice. MELT is designed to quickly, safely and effectively tackle frozen snow, sleet and ice on most driveways, steps, sidewalks, and entryways. MELT pellets attract moisture from its surroundings, speeding up the creation of brine to quickly lower the freezing point of water, generate heat, and melt snow and ice on contact. Packaged in a convenient, resealable jug for easy storage, MELT Calcium Chloride Pellets can be conveniently dispensed directly out of the jug or into a hand-held or wheeled salt spreader. Proven safe when applied as directed to quality concrete surfaces, MELT exhibits the following properties: MELTS DOWN TO -25F: MELT professional strength calcium chloride pellets effectively melt ice and snow on contact, even at temperatures as low as -25F. MELT 10 Lb. Jug Premium Enviro-Blend Ice Melter W/ CMA MELT enviro-blend ice melter provides a greener, yet equally effective, de-icing alternative to more harmful melting agents. When used as directed, MELT enviro-blend will not harm grass, wood, concrete, metals or other vegetation and is safer for pets, children and the environment. MELT enviro-blend exhibits the following properties: ANTI-CORROSION FORMULA: Enhanced with CMA (calcium magnesium acetate), an environmentally benign de-icing agent, MELT enviro-blend ice melter delivers fast and effective results without damaging metal surfaces, such as the exteriors of cars, trucks and other equipment. FAST ACTING: MELT enviro-blend goes to work immediately upon contact with snow and ice to accelerate the de-icing and melting process. Pre-treating surfaces with MELT enviro-blend will also prevent ice and snow from accumulating. LONG LASTING :MELT enviro-blend time-relaxed formula stays on the surface area longer for added protection and better control of the freeze/thaw cycle. MELT 10 Lb. Jug Premium Enviro-Blend Ice Melter W/ CMA is rated 4.5 out of 5 by 45. Rated 5 out of 5 by Senior from This jug is so easy to use - sprinkles the ice melt just right - and I can refill it. Good job. This jug is so easy to use - sprinkles the ice melt just right - and I can refill it. Good job. Rated 5 out of 5 by Fred from This is the first time I have used this brand... This is the first time I have used this brand of ice melt. I like this size of container because I am in my upper 80's and easier to handle an it did a good job. Would buy it again when needed. Rated 5 out of 5 by SB from I could see the ice I put it on and... I could see the ice I put it on and near instantly melting, and it didn’t re-form. Rated 5 out of 5 by Howie from Did a good job melting formed ice and limited accumulation.... Did a good job melting formed ice and limited accumulation. Rated 5 out of 5 by HomeDepotCustomer from Environmentally friendly product that seemed to be good option for... Environmentally friendly product that seemed to be good option for 1.5 year old concrete driveway. Is the snow Joe melt safe for stamped concrete I am worried about the sealant. Just had it done this year. Please advise or recommend another product. Not very keen on using messy sand.